Welcome to the Healing Power!!! My mission is to help people to Feel Better, to Live Longer, to Enjoy Life to the fullest extent and to reach a highest level of Health and a sense of Well-Being!!! People free of stress, pain and suffering can reach their highest potential and live most productive lives!!! 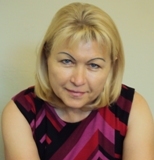 Tatiana is an experienced professional in the Holistic Healing and Massage Therapy Fields. She started her spiritual, holistic healing journey after overcoming a life threatening disease using a natural herbal remedies and alternative approach to heal Body-Mind-Spirit!!! In time, her Holistic Health approach has changed from a Hobby to a Profession!!! *Dosimetry is a discipline dedicated to measurements of the amount (dose), testing and evaluation of the effects of the electrical, magnetic, electromagnetic and different types of energy waves of different wave length, frequency and amplitude on living organisms. I Do what I Like and Like what I Do!!! Body Work, Energy Work and Healing are my Passion and my Gift!!! I am good at what I do, and I use the talent granted to me by nature in this life to help others live their lives to the fullest extent and highest potential. Healing Energy sessions are customized for a Client personal health condition or situation. During our first session I evaluatee your health issues. It gives me an understanding of what kind of energy work will be more suitable for you and you will benefit from it the most. My massage style is Therapeutic and Healing. Working with each client individually, I combine several massage modalities in one session according to your needs which will benefit you in multiple ways and will help you to heal physically and emotionally. During each session you will receive my undivided personal attention as you experience the many benefits of therapeutic touch from my healing hands in a professional and respectful environment!!! The true value of each of the modalities which I use in one hour massage/healing session is much more than $100 if ordered separately. As stated above, at The Healing Power you will receive Multiple Benefits when I combine the many different Eastern and Western massage and Energy modalities into one session. Offering this combination provides you with the greatest benefit and the best value for your money and allows me to keep my fixed rates reasonable and affordable. The customized and personal approach which I develop based on the needs of each individual is what attracts clients to my Massage & Energy sessions. In addition to the above services, as a Health Educator, I also share with my clients many simple practices and techniques of improving their Physical-Emotional-Mental Health and Well-Being! !